Last month my daughter Hayley announced she’d like to give a vegan diet a try. 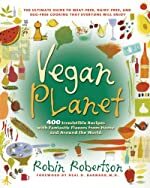 So, the next time Ward and I found ourselves in a bookstore, we decided to buy a copy of Vegan Planet, by Robin Robertson. Well, okay, it was more like Ward browsed around for a vegan cookbook and found Vegan Planet; I was too busy looking at all the fiction (you know how it goes …). Ward’s always been fascinated by the vegetarian lifestyle. Back before our youngest, Dylan, was born, he actually went vegetarian for a year. The only problem was, at the time he wasn’t into cooking the way he is now, and the only vegetable he liked was broccoli. So a “vegetarian” diet for him back then translated into cheese and more cheese! Not exactly the healthiest option. But now that he’s into cooking, he’s really conquered a lot of his old food dislikes (yes, he has eaten anchovies … and capers! ); with Hayley opting to be vegan for a while, he decided to join a 21 days of vegan challenge that a vegetarian friend of his told him about. So that left me as the sole omnivore in the household, my oldest having just moved onto campus and my youngest being primarily what we call a “pastararian”, as in he eats pasta and cheese and pasta with sauce with no “stuff” on it and not much else. But I have been very, very surprised by my new (mostly) vegan diet (“mostly” because Ward very thoughtfully will make a meat dish every now and then just for me – he’s been very faithful about sticking to his own 21 day challenge though, going so far as to start using soy milk in his coffee). Ward has cooked up about fifteen different recipes from Vegan Planet so far, and they have all been absolutely stunning in terms of taste. He even made a chocolate cake that was utterly delicious! I was actually thinking that maybe all vegan cooking is like this – highly flavorful and very filling – but Ward’s vegetarian friend has been cooking some of the recipes you get emailed to you when you sign up for this 21 days of vegan challenge, and she says most of them haven’t been very good at all. It used to be my favorite, but now it’s a toss-up, because Ward made some really delicious Korean-style scallion pancakes the other night that I find myself yearning for at all times of the day. Hayley’s favorites are a white bean cassoulet, which Ward has made twice now, as well as this vegan version of Pad Thai (which is also on my favorites list). Ward’s not sure whether he’ll stick with a totally vegan diet after the 21 days of the challenge are up; we both know, though, that the Vegan Planet has changed our perspective on vegan food (which I used to think must be bland and not very tasty). I am pretty sure that the majority of our meals in the future will be vegan. Sure, it’s very healthy, but even better, the dishes are so tasty and as a bonus, the house smells wonderful when Ward’s cooking! I’m participating in Weekend Cooking at Beth Fish Reads with this post; for more delicious cooking-related posts from book lovers, head on over to the latest Weekend Cooking post and check out all the other links! This entry was posted in Blogging and Blog Events, Books and Reading, Life and tagged cookbooks, cooking links, Food on September 19, 2010 by Belle Wong.